1. Please remove dirty and dust on the surface when stick. 2. 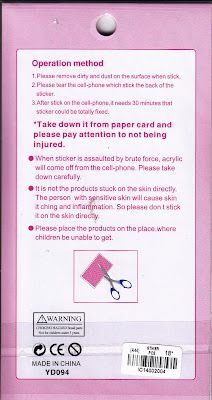 Please tear the cell-phone which stick the back of the sticker. **Quite possibly they meant "cellophane" here...? 3. After stick on the cell-phone,it needs 30 minutes that sticker could be totally fixed. *Take down it from paper card and please pay attention to not being injured. -When sticker is assaulted by brute force, acrylic will come off from the cell-phone. Please take down carefully. -It is not the products stuck on the skin directly. The person with sensitive skin will cause skin it ching and inflammation. So please don t stick it on the skin directly. -Please place the products on the place.where children be unable to get. OMgoodness! They placed the instructions in the place that I am not able to get. Dirty will not be assaulted or be stick today. Ah yes....because we all assault our stickers with brute force! You KNOW I got a kick out of this. I'm half scared that when I return to the U.S. I won't be able to understand "real" english again!! LOL!!! !